Check Rates1 Bedroom Suite 1 King Bed Bed and Breakfast! Check Rates2 Double Beds City View Bed and Breakfast! Check RatesAccessible 1 Queen Bed and Breakfast! Check RatesDeluxe 2 Double Beds Bed and Breakfast! Check RatesDeluxe King City View Bed and Breakfast! Check RatesDeluxe Room 1 King Bed Bed and Breakfast! Check RatesJunior King Suite City View Bed and Breakfast! Check RatesJunior Suite Bed and Breakfast! Check RatesKing Parlor Suite Bed and Breakfast! Statue of Liberty, China Town, Little Italy, World Trade Center, Ground Zero, South Street Seaport, Times Square, Brooklyn Bridge, Wall Street, Trinity Church. "Weekend stay for a wedding." As Hilton gold member we got upgraded to a suite with stunning views from our windows but the room is beyond dated with stained couch, old furniture is all beaten up/ chipped and carpet dingy. Rooms desperately need updating the staff is very nice and breakfast pretty good. 31-Mar-2019 Verified Review, stayed from Fri Mar 29 to Mon Apr 01 2019 at a $187.78 average nightly rate. 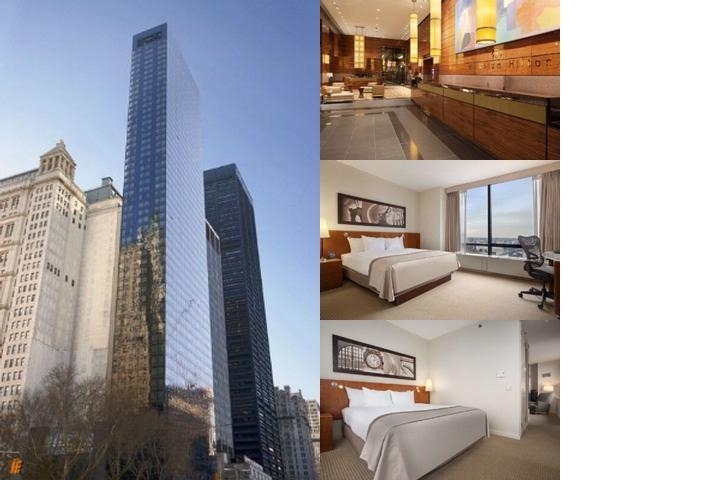 The Millenium Hilton hotel is located in the heart of Downtown's World Trade Center (WTC)/Financial District. You're just minutes from Wall Street, Greenwich Village, SoHo, Tribeca, Battery Park and the South Street Seaport.At the Millenium Hilton hotel in New York, guests can relax in well-appointed rooms and suites featuring high-tech amenities including a 42" plasma screen television, high-speed Internet access, dual-line cordless phone with data port and personalized voicemail, and the Hilton Clock Radio which provides a mini-plug for your MP3 Player. Enjoy a brisk workout in our state-of-the-art fitness center or take a vigorous swim in the indoor heated swimming pool. Toast the day's events in our chic lobby bar, Liquid Assets, or dine in our fabulous restaurant, Church & Dey, serving authentic American regional cuisine. Finally, rest your head on the Hilton Serenity® Bed with plush down pillows while you enjoy room service and an in-room movie at the Millenium Hilton hotel in New York City. 24 hours before arrival date. JFK Airport, 45 minutes by taxi. Laguardia, 30 minutes by taxi. Newark International, 45 minutes by taxi. Below are the meeting, banquet, conference and event spaces at Millenium Hilton. Feel free to use the Millenium Hilton meeting space capacities chart below to help in your event planning. Hotel Planner specializes in New York event planning for sleeping rooms and meeting space for corporate events, weddings, parties, conventions, negotiated rates and trade shows. 61 x 18 x 9 Ft.
41 x 22 x 9 Ft.
15 x 15 x 9 Ft.
85 x 44 x 9 Ft.
45 x 18 x 9 Ft.
23 x 14 x 9 Ft.
30 x 18 x 9 Ft.
40 x 18 x 9 Ft.
46 x 18 x 9 Ft.